Edward E. 'Ed' Clark (b. May 4, 1930) is an attorney from San Marino, California. He is best known for his 1978 campaign for Governor of California, and his 1980 Campaign for President of the United States. Clark, born in Massachusetts, was an honors graduate of Dartmouth College and received a law degree from Harvard Law School. He was the first State Chair of the New York Free Libertarian Party and upon relocating was elected the State Chair of the Libertarian Party of California. He was elected Vice Chair of the national party at the 1972 National Convention in Denver, Colorado. In 1978, Clark ran for Governor of California. Although he was a registered Libertarian, the Libertarian Party did not yet have ballot status in California and he ran as an independent. Clark received some 377,960 votes, 5.46% of the popular vote. His vote total in that election is still a Libertarian Party gubernatorial record. 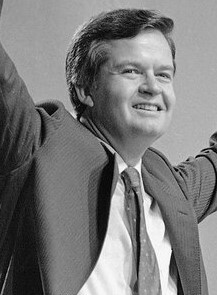 In 1980 Clark won the Libertarian Party nomination for the Presidency at their party convention in Los Angeles, California. He published a book on his programs, entitled A New Beginning. The book's introduction was by Eugene McCarthy. During the campaign, Clark positioned himself as a peace candidate and tailored his appeal to liberals and progressives unhappy with the resumption of Selective Service registration and the arms race with the Soviet Union. When asked in a television interview to summarize libertarianism, Clark used the phrase "low-tax liberalism," causing some consternation among traditional libertarian theorists, most notably Murray Rothbard. 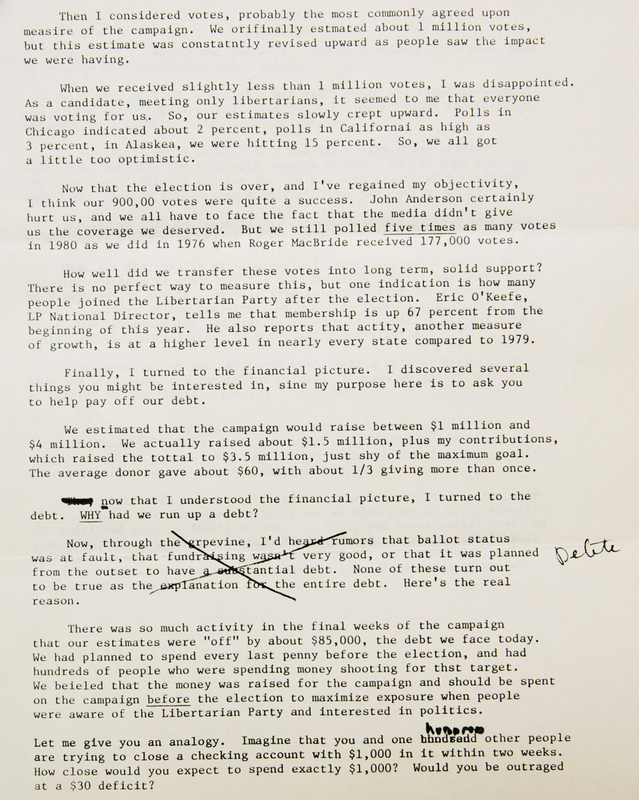 A growing split within the Libertarian Party between a moderate faction (including Clark) and a purist faction led by Rothbard eventually came to a head in 1983, with the moderate faction walking out of the party convention. Ed Clark's running mate in 1980 was David Koch of Koch Industries, who pledged part of his personal fortune to the campaign in exchange for the Vice Presidential nomination. Koch contributed about $2 million of the Clark campaign's $3.5 million fundraising haul. Clark received 920,049 votes and 1.06% of the total nationwide; Libertarian Party presidential candidate records that would stand until Gary Johnson's 2012 and 2016 campaigns. His strongest support was in Alaska, where he came in third place with 11.66% of the vote, finishing ahead of independent candidate John Anderson and receiving almost half as many votes as Jimmy Carter. This page was last edited on 15 October 2018, at 18:14.